CMH Heli-Skiing have a programme for whatever your Winter Heli-Skiing needs might be. Do you want an adventure with the family or experience the refashioned Gothics Lodge or maybe age has diminished your ability to be a powder hound all day but you still want the thrill of the best deep powder in the world. Here are just three adventures with CMH Heli-Skiing brought to you with our association with Pure Powder. So the kids are itching to get away this skiing this winter but the idea of facing another expensive trip to Europe with the rest of the world is giving you cold sweats. Cue Pure Powder who has put together a magical family package that offers the perfect solution in one of the most beautiful ski locations in the world. Enjoy off piste skiing as a family and when the kids get tired they’ll be helicoptered back to the lodge for more fun and games while the parents indulge in the ultimate powder. Staying in the legendary Bugaboos Lodge accessible only by helicopter, this is the ultimate ‘get away from it all’ family holiday. The super chic lodge offers luxury log-cabin style bedrooms, relaxation galore with an outdoor hot tub and sauna and sumptuous meals designed to keep all the family happy. As the birthplace of heli-skiing in the 1960s, this is the ultimate history lesson for your ski-hungry little ones. Skiing in the Bugaboos, you’ll have access to some of the finest heli-skiing in the Columbia Mountains, with a great variety of alpine terrain as well as superb tree skiing. Your family will ski with fully qualified mountain guides, famed for their personalities and if it’s tough keeping up with your sprightly new powder hounds, you can return to the lodge to relax in the hot tub or have a massage. Your Nanny can even join you for a supplement of £1,600, relaxing in the day but looking after the kids each evening. This is the ultimate family ski adventure for all those bored of the Alps and looking to introduce your children to new experiences – Pure Powder’s Family Adventure delivers on every level. Your accommodation is a large luxury lodge at CMH Bugaboos in British Columbia with your first night in a hotel in Calgary at the beginning of the trip. The food is supplied by 2 private chefs on site and soft drinks are included. There is 1 private Ski Guide per 11 skiers and a Bell 212 Helicopter which provides you with 6.5 days of heli-skiing with 35,000 vertical metres of skiing (15,250 vertical metres are guaranteed for the children). The flights and transfers are return Economy flights to Calgary and transport to and from the Lodge. The number of nights will be 9 (departing on Friday and returning on Sunday). Also included are the use of CMH Atomic and K2 skis or Burton snowboards and the all important training in and use of avalanche transceivers, shovels and probes. 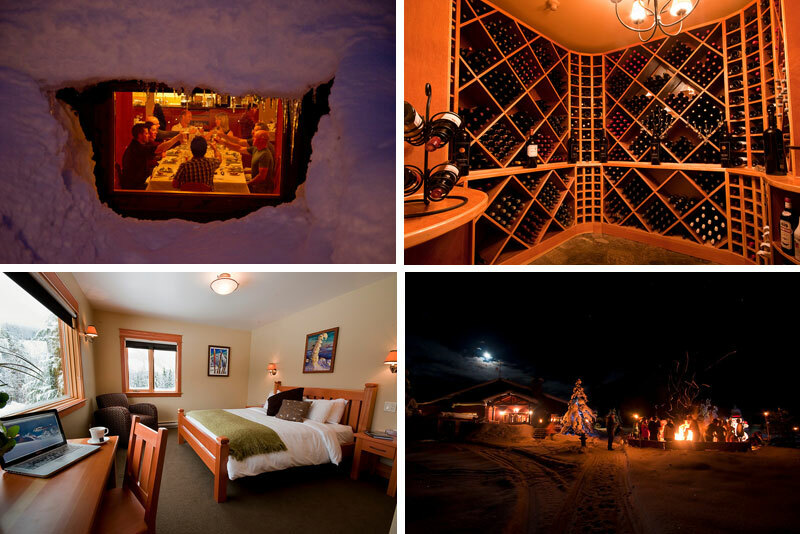 Pure Powder are also delighted to introduce to The Vintage Magazine readers CMH Heli-Skiing’s renovations to its Gothics Lodge along with a sizable expansion in its ski terrain in the Selkirks sub-range of the Columbia Mountains for the 2013-2014 season. The refashioned Gothics Lodge opened on December 7th 2013 for the CMH Heli-Skiing season, features new interior design by the cutting-edge Portland based design firm, Skylab Architecture. This new design concept for the public spaces of the Gothics Lodge seeks to connect the rugged terrain for which CMH is known with a warm, yet contemporarily designed alpine lodge. The renovations include an overhaul of the central living and communal dining areas of the lodge, adding designer wrought iron chandeliers with hand blown glass, decorative antlers, wood accessories, digitally printed alpine views and Swiss-stacked fir tables from a regional Canadian designer to the lodge’s iconic native Douglas fir walls and columns and large stone fireplace. Guests of the Gothics Lodge will also benefit from a significant expansion to the lodge’s skiable terrain, which will add 18,000 acres to its tenure – an additional area almost as large as the three largest ski resorts in North America combined. Watch this video – how can you resist just wanting to try this? The programme is designed for experienced skiers who treasure quality over quantity. The heli skiing is as good as ever but there is very much a focus on enjoying the skiing in a fun and relaxed group. The programme would be for 10 guests, with two guides in the group and based out of CMH’s classic remote lodges, the Bugaboos or the Cariboos. Click on the lodges for more details of this programme. CMH Heli-Skiing founded in 1965 makes them the world’s oldest and largest heli-skiing operator. From their head office in Banff, Alberta, CMH operates exceptional mountain experiences based from 11 lodges located in the Bugaboo, Purcell, Selkirk, Monashee and Cariboo ranges of British Columbia, Canada. Heli-skiing takes place each year from December through April.